Chandler Lippett, an attorney for DCP Midstream, gestures to an aerial photo of the Mack Point port facility in Searsport during Monday night's planning board meeting. 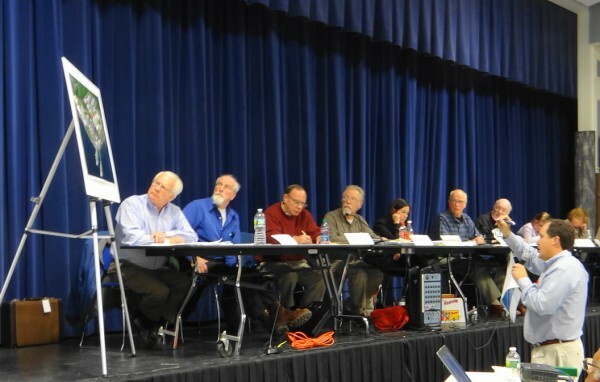 SEARSPORT, Maine — In the first of four meetings to gather public sentiment on the proposal to build a $40 million, 23-million-gallon liquid propane tank, the town planning board on Monday night set the stage for what will follow. More than 150 people attended the three-hour session in the Searsport District High School cafeteria. Several police officers were posted at the meeting, but there was no conflict, and only the occasional outburst of applause when a point was made in favor of opponents. The board voted that applicant DCP Midstream met the requirements for the review that will determine whether the project meets the land use ordinance standards. The board also granted “interested party status” to several individuals and groups that hope to persuade members that the project should be denied. The key opponent is the group Thanks But No Tank, or TBNT, a grass-roots organization that mobilized almost a year ago to fight the project, seeking a moratorium at the March annual town meeting. The moratorium failed in a 165-297 vote. TBNT was represented at Monday’s hearing by its attorney, Steve Hinchman. The board granted the group interested party status, which board chairman Bruce Probert explained gave it the ability to question the applicant and cross-examine the applicant’s consultants and others presenting information about the project. Also granted that status was the Islesboro Island Trust, a land conservation group on the island that has opposed industrial development at Searsport’s Sears Island and Mack Point port facility because shipping serving the ports would pass by the island, and because the island’s northernmost area has views of the ports. Albert “Buddy” Hall, owner of Angler’s Restaurant and Bait’s Motel, also was granted interested party status. His businesses abut the land for which the tank is proposed. Hall was represented by attorney Ed Bearor. The Friends of Sears Island group, represented by member and resident Marieta Ramsdell, also was granted the status, as were resident Phyllis Sommer, owner of the Pumpkin Patch Antique store, Jay and McCormack Economy, owners of the Yard Arm Motel in Seasport, and David Italiaander, owner of a historic brick building in the downtown. DCP Midstream’s attorney, Jamie Kilbreth, objected to several of those seeking status, arguing that the Superior Court recently dismissed a challenge to the company’s Department of Environmental Protection permit based on their lack of standing. But Probert indicated he was taking a broader view of the process. “I like to err on the side of letting people express themselves,” he explained. Still, the board did reject two individuals seeking status, while others agreed to consolidate their views with TBNT. Last month, the board voted that DCP Midstream’s application was complete, culminating months of meetings at which various studies and documentation were requested. That vote set up this week’s public hearing sessions, which will then lead to actual deliberation by the board on whether the project meets the dictates of the town ordinance. Late during Monday night’s meeting, the board formally voted that it had the authority to review the application, and that DCP Midstream itself had standing to apply. But TBNT challenged the latter, arguing that the company held only a draft DEP permit for the pipeline that will connect the off-loading facility at the Mack Point dock to the tank about a half-mile away. TBNT’s Hinchman noted that the ordinance requires the applicant to have all permits in hand. The board’s attorney, Kristin Collins of the Belfast firm Kelly and Collins, agreed with Hinchman that permits are required, but advised the board that minor amendments could be considered pending and the review could continue. The pipeline, though, sparked more questions from the board members, who asked about what rights DCP had secured to build it, as it will cross several properties and a town road. DCP submitted a petition to the board Monday with 612 signatures supporting the project. The public hearing process continues from 6 to 9 p.m. Tuesday at the high school.